Make a tin can telephone with a friend. Investigate which connectors transfer the sound most effectively (maybe wool, string or plastic coated wire). What is the longest connector you can use that still transfers the message? Does the connector need to be taut? Try using yogurt pots instead of tin cans: which work best? A responsible adult should drill or punch a hole into the bottom of each can, and check that the cans have no sharp edges. Design a uniform for a marching band. Look at online images for inspiration. Listen to another traditional tale featuring a soldier character, perhaps ‘The Tinder Box’ or ‘Stone Soup’. Practise retelling the story so you can tell it to your classmates at school. Perhaps you could make stick puppets to bring the characters to life? Record some sounds at home to create your own sound quiz. What about the sound of the washing machine, the babbling of your baby brother or sister or the theme tune to your favourite TV programme? Can your classmates identify the sounds? 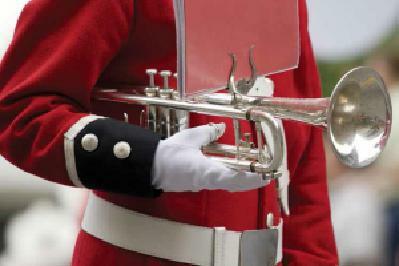 Find a poem, nursery rhyme or song about marching. Learn it by heart to perform at school. Using the web, find out about interesting drums from other countries. Draw a picture of your favourite, locate its country of origin on a world map and watch an online video of someone playing it.